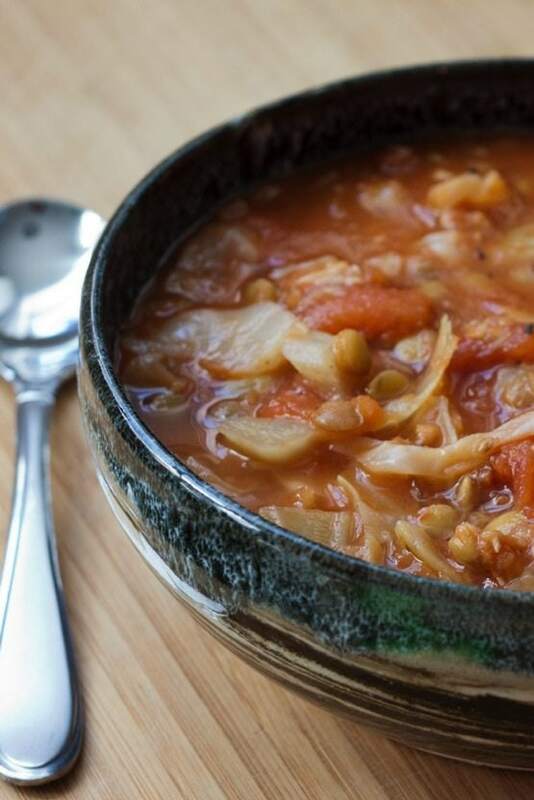 A warm and cozy cabbage lentil soup with health boosting ingredients like miso and apple cider vinegar. Brrr… it’s been so cold and snowy here that all I’ve been wanting lately are warm and comforting foods. I actually made a salad for lunch on Tuesday and ate about half before deciding it was way too cold to be eating a salad. I rarely let food go to waste once it’s been plated (especially good salads) so this was a definite sign that my body needed something warm. A big pot of soup was immediately put on the agenda for dinner. I didn’t know exactly what type of soup I wanted to make but I knew I didn’t want to make a run to the store in 16 degree weather so I had to make something with stuff we had already had on hand. Luckily we had an onion, garlic and veggie stock, my go-to base ingredients for soup. I’d also made a batch of lentils earlier in the week, which was supposed to be for topping salads but since I obviously wasn’t craving salads this week, I decided they could easily be used for the soup instead. I added a few veggies, some spices and a little miso to give the soup a good depth of flavor and crossed my fingers hoping it would turn out well. 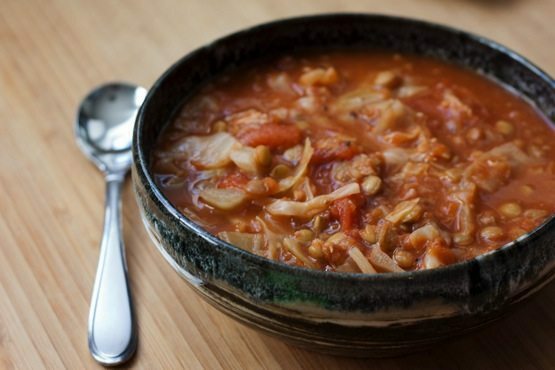 Not only is this soup flavorful and amazingly comforting on a freezing cold day, it’s packed with health-boosting ingredients (including my fav healthy secret ingredient: apple cider vinegar). I hope you all like it as much as we did. Happy Friday! In a large soup pot, heat coconut oil over medium heat. Add onions, cook and stir until onion is tender. Stir in garlic, bay leaf and basil; cook for 2 minutes. Add 1 Tablespoon of apple cider vinegar to deglaze the pot. Add stock, canned tomatoes, cabbage, miso and sriracha. Bring to a boil. Reduce heat, and simmer for at least 30 minutes. Add in cooked lentils and simmer for around 20 minutes. Season to taste with salt, pepper and additional apple cider vinegar. *I used previously soaked and cooked green lentils that I had on hand, but you could add 1/2 cup of uncooked, dry lentils that have been soaked overnight instead. If you do this, you’ll want to add the lentils when you add the vegetable stock and let the soup simmer for 50-60 minutes or until the lentils are cooked. mmm sounds delicious and homey! 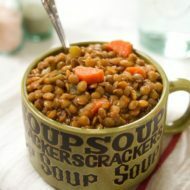 You should try the Coconut Lentil Soup that I made recently from Redbook! mmm!! This sounds delicious! I was called an old lady for liking cabbage the other day, glad to see someone else likes it too! Will be giving this a try on one of these snowy days we’ve been having. This looks fantastic! I love the use of the ACV in it 🙂 Definitely going on my list of things to make! This looks really delicious! Can’t wait to try it out! Cabbages and lentils are so tasty! It is like Amy’s Organics soups except even better because it’s home made! I am so making this on the weekend! Love everything about this! 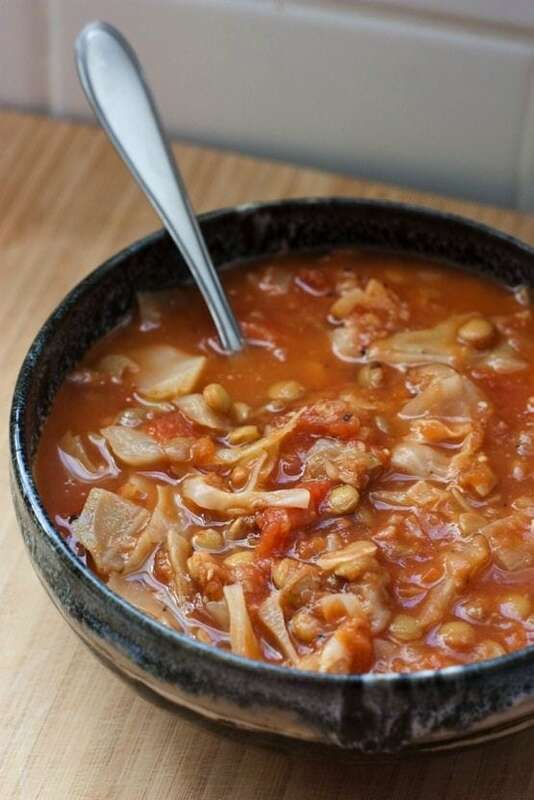 Hi Lily — Thank you so much for commenting and for trying the lentil soup. I’m pumped that both you and your husband enjoy it!! This sounds perfect for the cold wintery season that is upon us! Can’t wait to try it out. Made this tonight. 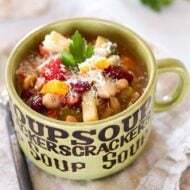 It’s a really good ummm what can I make with what I have in the pantry sort of soup. Nice SBS hearty. So glad you liked it Kristina! This looks delicious, I totally plan on making this! One thing I would add however, is that the miso shouldn’t be boiled! Miso has all sorts of amazing probiotics and tons of enzymatic digestive benefits being a fermented food, but both probiotics and enzymes are living organisms that cannot withstand boiling temperatures. Just my two cents for those who are looking to get the full health benefits of the miso! Oh wow, I actually never knew this so I’m glad you commented. I’ll know not to boil it from here on out! Looked this up after trying nearly the same thing. Used chicken stock and olive oil brine (which is a great ingredient). I carmelized the onion and cabbage which will sweeten the result. Try it. Thinking of starting a frugal home cooking vlog. I have to chime in and say how delicious this was! I didn’t have high hopes but the larder was pretty bare and this fit what I had on hand. 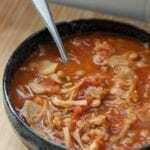 I used lamb stock and it was really amazing – will make in the future for sure! I made this tonight in my Instant Pot, 15 minutes manual high pressure, at least 10 minutes slow release. I skipped the oil, sauteing onions and garlic in vegetable broth instead. Mine wasn’t terribly pretty, as I used red cabbage instead of green, but it was definitely delicious. 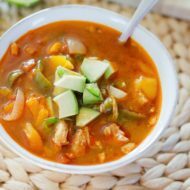 I’ve been making this soup for years in order to keep my diabetes under control. It does wonders & I even make it in the summer time. When I stray away from my diabetes diet Love it. Love this soup. I make a large batch up and freeze some. Tastes great and healthy too. Thanks.